anyways saw this the other day, how many can remember these, something a little unusual eh? motoring at it's simplest 1971 style, 3 wheeler ( drive on motorbike license ) and this one still had original 700cc engine. I think it must have been the weekend for classic car or modern classic car shows.. 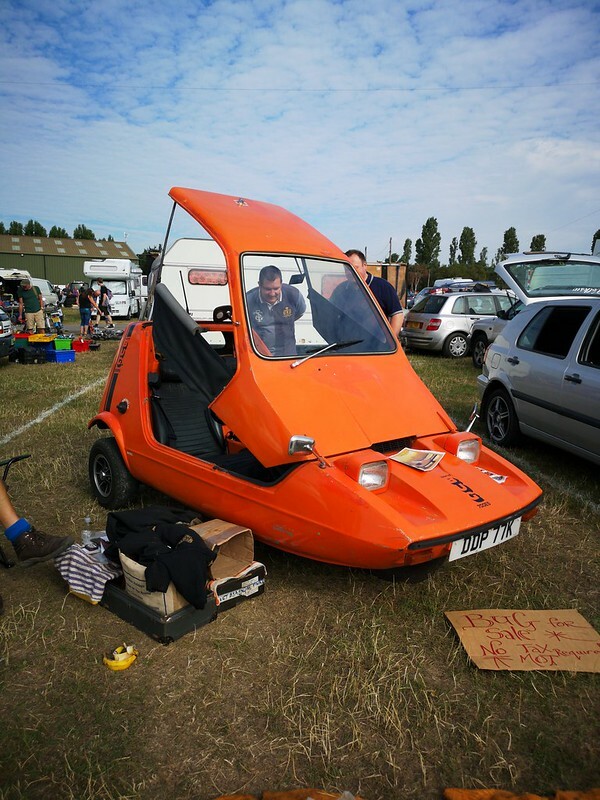 The Old Bond Bug, well that takes me back! I bet their worth a bob or two now. In good fettle they are worth around 7 to 10K, this one which incidentally was driven to the auto jumble, needed a little work and was priced at £4600. I'd have it, but my problem is I'd have all the cars I like and A I don't have no money and B I don't have no where for them !! I'm a dream collector !! Eww, quality is very poor. I didn’t download the original from my drone, so I live and learn. That’s why I’m practicing so as can get it right for my sons wedding in Italy next year, he wants some aerial shots and videography. Is that just down the road from Gatwick !! I daren't take mine out at mo, probably get lynched. Wish I could post videos, I have some nice ones! I have a few really nice ones from Vietnam. Like you, it’s staying in at the moment. I recently got stopped flying it at my local stately home, (where I took this photo) despite being nowhere near the building or any people. However, on private land, you have to comply with their rules, even though I wasn’t breaking the law. There again it is the size of a postage stamp !